On-premises software is a software that is installed and runs on computers in the location of the person / company using the software. This is the traditional software installation in a business environment. An off-premises software is a software that is not installed in computers on the premises. It could be at a remote facility (a server farm) or it could be in the cloud. 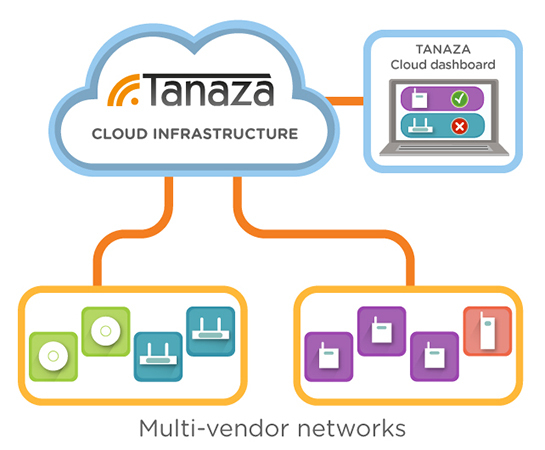 Tanaza is a software-as-a-service, it is hosted on a public cloud, and the user doesn’t install it on his computer. In SaaS (software-as-a-service), the user does not pay for the software itself. The user, instead, subscribes to the service and gets the authorization to use the software from the web. Cloud deployments allow people to focus less on infrastructure and application delivery, and more on business priorities. Reduced time to value: cloud-based deployments reduce the overall implementation time of projects, allowing the business to get value sooner than traditional on-premises deployments. The software is immediately ready to use. The vendor provides mush of the work and makes the software work for you. Painless discovery phase. With many SaaS companies (included Tanaza) offering free trials, you can test the software and see if it works for your company and your specific needs without spending a fortune. Lower cost of entry and flexible pay-as-you-go options + Reduced total cost of ownership (TCO). Lower up-front costs and the subscription-based payment method are two benefits of the Saas model. With SaaS, you pay for what you need, without having to buy hardware. The costs are easily predictable, even if you grow quickly. Upgrades and maintenance don’t entail additional costs. No problems with upgrades, uptime, integrations and security. The vendor has the responsibility for maintaining the software operative, upgrading it, ensure the reliability and the SLAs. Easy and flexible integration options with most SaaS products. Minimal IT dependency: your IT team involvement is limited to the discovery phase, the testing phase, and the validation process. The IT team is not responsible for enforcing regulatory requirements, upgrades, availability, and reliability. Use the software, wherever you are, only accessing the web. Multitenancy. The multitenancy cuts the costs by allowing vendors to create new applications for many users and allowing the users to share the same underlying infrastructure. Any new feature has already been provisioned, implemented, and tested by the vendor. Scalability. If you scale with a SaaS, you don’t have to buy additional hardware and go on the customer’s premises to install it. The use of SaaS has skyrocketed over the past few years. Gartner estimates total SaaS spending will exceed $22 billion in 2015, an increase of more than 57 percent from the $14 billion spent in 2012.